What had happened was that when adding an IPv6 BGP session, I didn't specifically tell the router to not do IPv4 over that session. So despite the session being between two IPv6 addresses, the routers on both sides negotiated the use of the IPv4 unicast address family over that session, and thus exchanged IPv4 prefixes. Or you can make a route map that sets the next hop address to an address that does work. For iBGP, it's often easier to also use the IPv4 BGP sessions for IPv6, as the number of iBGP sessions adds up quickly and iBGP doesn't modify the next hop address, so the issue above doesn't come up. However, there's an additional complication when mixing IPv4 and IPv6 in BGP: debugging gets much harder. So with these commands, we get to see the BGP sessions for which IPv4 or IPv6 is activated, regardless of whether the session runs over IPv4 or IPv6. So far, so good. And in later Cisco IOS versions, I believe this works the same for other show bgp commands. 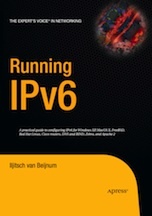 But under older IOS versions the IPv4 commands won't always take an IPv6 address and vice versa. But at least under Cisco IOS, the commands now make a reasonable amount of sense: rather than show ip bgp ... for IPv4 and show bgp ... for IPv6, we can now use the much more consistent show bgp ipv4 unicast ... and show bgp ipv6 unicast ... commands. Not so much under Quagga, though. At least, under version 0.99.22.4. The good news is that you can actually use show ip bgp neighbors <IPv6 address> and show bgp neighbors <IPv4 address>. The bad news is that even though Quagga understands the show bgp ipv4 unicast summary command, it doesn't understand the show bgp ipv4 unicast neighbors ... command. You have to use show ip bgp neighbors ... instead. So the moral of the story is that you make life a lot easier if you don't mix IPv4 and IPv6 in BGP. If you do, it helps to use recent software, but make sure you check all the possible variations of the different commands, because they're not necessarily used consistently.